Economics is often and mistakenly regarded as a subject that male students are more interested in than female students. The Economics team here at BHASVIC, as part of our campaign to promote our fascinating and diverse social science to all, were delighted to learn that one of our students, Rebecca Holmes, was also actively working towards dispelling this misconception. Rebecca recently wrote to Mark Carney, the Governor of the Bank of England, to challenge him on the lack of diversity in Economics. His reply, while not providing any answers, highlighted his interest in this issue. In his letter to Rebecca he identified that Economists employed by the Bank of England are working on fascinating projects such as the impact of Artificial Intelligence on the future of work, the role of the financial system in combatting climate change, the value of diversity in decision-making, and the impact of mental health, crypto currencies and driverless cars on jobs, growth, inflation and well-being. Rebecca has also recently entered the Bank of England’s essay competition. The theme of the competition is the Future of Money and Rebecca submitted an essay titled ‘The Cost of Being A Woman’. 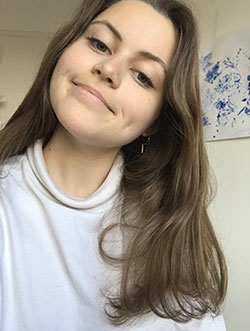 She was also able to use her Economics insight during her work experience placements at Ernst &Young and PWC over the summer break between A1 and A2. Rebecca is currently a second year student here at BHASVIC studying Economics, Geography and Textiles. Why did you chose to study Economics? I chose to study Economics because I have always been interested in how money works and the impact it has on human behaviour. What topic(s) have you found particularly interesting and why? I am particularly interested in Micro Economics more than Macro Economics because it provides a clearer understanding of individual decision-making and the incentives behind them. What topic(s) has shocked you and why? The Gender Pay Gap – the focus of my EPQ dissertation. What do you plan to do with your Economics A Level? I want so start my career as an intern for the Bank of England because I feel it is an organisation that has a more socially responsible work ethic than accountancy. What are you university and / or career plans? I have applied to study Land Economy at Cambridge University, Economics at Nottingham, Newcastle, or Leeds, or Economics & Politics at Manchester. What motivated you to write to Mark Carney? I recently wrote to Mark Carney, the Governor of the Bank of England, to ask him about the lack of diversity in Economics because, with my career in mind, I wanted to challenge my future boss on this issue! I understand that your EPQ project is on the Gender Pay Gap? Why did you chose this topic? I am interested in researching the confusion around the Gender Pay Gap, and the reasons why, from an Economic perspective, this gap be reduced considering we live in capitalist society. Do you have any solutions to speed up the closing of this gap (ahead of the forecast 2059 date)? Unfortunately, I think much of the gender pay gap does not have simple solutions for it to be solved. Although, I believe increasing the availability of flexible working and decreasing societal gender roles would significantly lessen the pay gap. If you’re unsure of what Economics is then here’s a summary: Economists study human behaviour as a relationship between a better quality of life and the scarce resources available that all have alternative uses. Economics is about choice and the impact of our choices on each other. It relates to every aspect of our lives, from the decisions we make as individuals or families to the structures created by governments and firms. The economic way of thinking can help us make better choices. By studying Economics, you can go into anything from teaching to oil production, the environment to investment banking, working in government to running your own business. Economics really does open doors. If you want to read about successful women in Economics then please click on this link. The title of this article seems to disregard the question asked, however, I think it is easier to listen to information we want to hear. Therefore, we ask questions we want answers to. But, I think, greater awareness is gleamed from the questions that we choose not to ask. Hence, I have written my article on the topic of gender disparities. Although, I do hope the future of money is a more equitably prosperous one. There are costs affiliated with being biologically female. The cost of sanitary products is approximated by the Guardian at £3.50 per period. The average woman has 450 periods in her lifetime, totalling a cost just over £1,500. Additionally, gendered pricing was approximated by Forbes to cost just under £1,000 per woman per year. There are many less obvious costs of being a woman. World Health Organisation research found that 1/3 of women globally will experience physical or sexual violence in their lifetime. It would be completely morbid to attempt to attach a financial cost to this statistic but clearly it has very detrimental psychological impacts. This statistic is not to disregard the violence and inequalities faced by men but to state the fact that generally women are disadvantaged by sexism. However, the male suicide rate is a very pressing issue that I think needs to be better responded to. The gender pay gap is another one of the costs faced by woman. The gender pay gap for Actuaries, Economists and Statisticians is 23.9% (ONS, 2017). This demonstrates a significant proportion of the issue – that women generally pursue careers in less lucrative areas. For example, Economics is one of the highest earning degree subjects yet only 30% of those who study economics at A-level and university are women. Encouraging more women to study subjects that are typically male dominated would, I believe, help lessen the gender pay gap. When I wrote to Mark Carney about this it was encouraging to hear his awareness of the necessity for a greater level of diversity. But the bank still has a long way to go to eradicate their gender pay gap. I recently read “Everyday Sexism” by Laura Bates which explores the normalised experiences of sexism faced by women on a day-to-day basis. Now you may be, validly, wondering what relation this has to economics. I don’t think the creepy thirty-something-year-old man who stopped me outside school to tell me I was pretty and to ask me where I was going was contemplating the economic implications of his actions. Singularly these events have little impact on the economy, but I think cumulatively their impact is significant. I believe every uncomfortable stare, whistle or sexist comment is yet another uttering to a young girl that she is not worthy of respect. The unfortunate outcome of this is that she starts to believe it so does not reach her full potential. How can our economy reach its full potential if we don’t enable the whole labour force to be fully utilised?